Moose fairy dust: Now with diagrams! | transfixed but not dead! Moose fairy dust: Now with diagrams! Moritz Lenz mentions in his excellent Perlgeek.de blog that there is not enough pictures being used alongside posts in the Perl blogosphere. Moritz is absolutely correct so I’ll make immediate amends by reproducing the core of my last post about how Moose Roles implemented singleton methods with some helpful diagrams. $baz is the instantiated object of the Animal class. 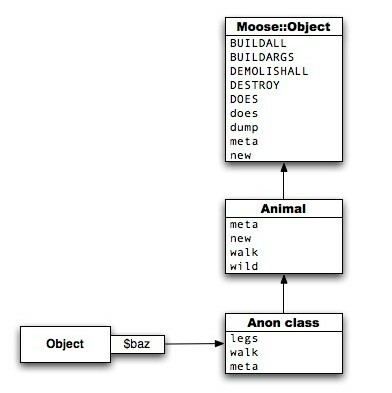 The Animal class contains all the methods we defined (along with “new” & “meta”) and its superclass is Moose::Object. NB. Moose::Object is the ultimate superclass which all Moose classes relate back to. In Moose::Object we can see all the base methods. The anonymous class was created when the DoesHuman role was applied to $baz object and it now stands proudly at the front of the inheritance chain for $baz object. Thus we have added singleton method(s) to an object by using Moose roles. I think Dave Thomas’s presentation on Ruby’s object model that I link to in very first post of this “series” deserves most of the credit because it inspired me to see how this all worked in Moose. this is helpfull and beautifull! can you tell me what are the tools used for highlighting code and drawing diagrams ? NB. I’m hoping at some point the free WordPress account will add gist (Github) syntax highlighting. That one does come with proper perl syntax highlighting! For diagrams I used OmniGraffle which runs on the Mac. I’ve used for this for all my diagrams for last five or so years and highly recommend it. You could look at AutoDia or UML::Class::Simple on CPAN to do this? 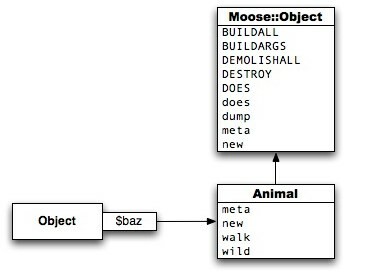 I’ve tried UML::Class::Simple before… it doesn’t work (yet) with MooseX::Declare but it does work on classic Moose. Auto-generating class diagrams would really be a useful way to visually show the power of Moose metaprogramming. bekanntlich es ist eindach nicht alles so (für jemanden) ein Sonntagsspaziergang sein. Vielen Dank dafür obendrein mach fort so! Moose Singleton Method: Now without roles! « transfixed but not dead!